Mervyn Smyth, a visiting fellow at the Honfleur Gallery in Washington, DC, took a series of powerful images of people and places in Anacostia, and used them in an exhibit called Anacostia Exposed. The project was a local version of a similar project Smyth had developed in his native Belfast, Ireland. This book, funded by the Humanities Council of Washington, DC, accompanied the exhibit. It includes works of poetry, and a foreward by author Thomas Sayers Ellis. 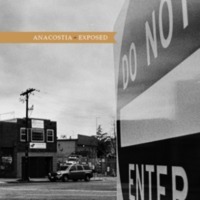 Smyth, Mervyn, “Anacostia Exposed,” DC Digital Museum, accessed April 22, 2019, https://wdchumanities.org/dcdm/items/show/1529.